Anyone who supports a programming language in an Eclipse-based IDE will be asked sooner or later to offer automated refactorings - similar to what is provided by the Java Development Tools (JDT). Since the release of Eclipse 3.1, at least part of this task?which is by no means simple?is supported by a language neutral API: the Language Toolkit (LTK). But how is this API used? "Refactoring" is a programming technique for improving the quality of the source text (e.g. with regard to maintainability or extendibility) while preserving existing behaviour. This is done by the gradual reformulation of the code in which the semantics of the program part being edited is left unchanged. In order to make sure that no inadvertent errors are introduced, each refactoring is checked using a suite of unit tests. Larger refactorings can involve a considerable amount of program code and work. As long as they are implemented in small steps, however, they can often be regarded simply as a sequence of atomic changes. These changes, such as the renaming of variables or the extraction of a program block into a new method, are also described as refactoring. An extensive catalogue with a precise description of the steps required - as well as the potential risks - is provided by . Reliability is the greatest when the atomic steps of the refactoring can be automated - not only because a tool guarantees the correctness of the automated steps but also because the developers that carry out the refactoring are able to pay attention to the larger context instead of having to carry out the numerous small changes to the actual source code. The Java IDE of Eclipse (JDT) now offers a variety of such automated refactorings (the most common of these are described in detail in ). The JDT team has extracted the recurring elements in the implementation of these refactorings into a language neutral layer that is now available in the Eclipse platform as a standalone API and can thus be used independently of the Java support. This layer is called Language Toolkit (LTK) and can be found in the org.eclipse.ltk.core.refactoring and org.eclipse.ltk.ui.refactoring plug-ins. It also includes an infrastructure (the so-called refactoring participants), which enables other plug-ins to take part in refactorings selectively via extensions (please see the box " Refactoring Participants "). 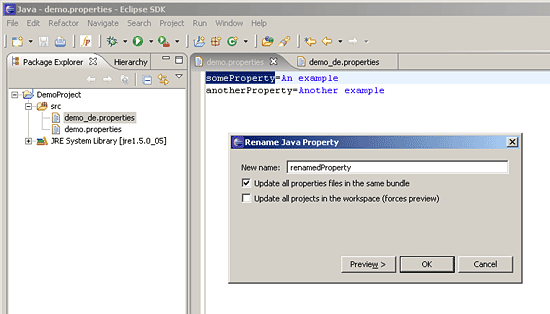 PDE (the Plug-in Development Environment of Eclipse) provides an excellent example of the use of Refactoring Participants. It manipulates the manifest files for the development of plug-ins (primarily Manifest.mf and plugin.xml), in which Java classes are often named. If the name of a class changes during a refactoring of the Java source code, then the declaration of this class must also change in the manifest file. PDE participates in Java refactorings in order to meet this requirement. The renaming of classes that are referenced in manifest files is recognised by the PDE and the appropriate adjustments are made. Eclipse is probably still best known as a Java IDE. The potential of Eclipse as a platform for the integration of tools that come from different programming languages environments is also becoming increasingly evident, however. This can be shown particularly well using the refactoring participants: A project that is developing an IDE for C/C++ based on Eclipse has been in progress for a number of years at Eclipse.org: The C/C++ Development Tools (CDT) project. Since the appearance of its version 3.0 , CDT offers automated refactorings that are implemented based on LTK. In a workspace in which Java and C development are combined, it would be desirable to have refactorings on the Java side (like the renaming or moving of native methods or classes which contain such methods), as well as those on the C side (the renaming of JNI-bound functions) be recognised on the corresponding side, and if the appropriate changes could be performed automatically. The refactoring participants would have to be implemented in a standalone plug-in in order for JDT and CDT to remain mutually independent of each other. Such a plug-in would ideally be an extension of both development environments. The following implementation example should enable the renaming of keys in properties files. Several such files (which may be in a single project, but could also be distributed throughout the entire workspace) are often combined into a bundle for the localisation of user interface texts. A file containing default values might be named texts.properties (no language information is included in the file name). Related files are identified with the help of a naming convention. The file texts_de.properties contains translations into German, texts_fr.properties contains French texts, etc. The renaming of a key in such a file usually entails changes in all other files of the bundle. Such a process is ideal for automation - and the example implementation makes this possible. When the user opens a properties file in a text editor and selects a property key, he can start a refactoring by selecting an entry in the context menu that renames the key in the file, optionally in all files of the associated bundle or even in all properties files in the workspace. This refactoring leverages the same familiar user interface as those provided by the Java IDE; including the the same preview option. This is implemented with the help of LTK. Refactorings are transformations of the program; in most cases, they are a manipulation of source code. In order to carry out such transformations (and the analyses preceding them), a programmatically manipulable representation of the developed system is required. JDT for example has an object model of all language elements (classes, fields, methods - both in the source text and in libraries or compiled class files) for the entire Eclipse-workspace (all projects) - as well as a (generated on demand) representation of individual source files as an abstract syntax graph (Abstract Syntax Tree - AST). This enables a specific search for occurrences and language elements. Even simple refactorings contain partial processes such as "Find all places where the variable x is used". A plug-in will hardly be able to provide automated refactorings without tools for such analyses. The theoretical background is just as essential (almost even more important): A very good understanding of the places in which the source code must change is required (and what the code should look like after the change) so that the program semantic is preserved. A formal description derived from the language specification is ideally available. With such a description, the code manipulations themselves as well as the corresponding test cases can be developed. The refactoring is started by the user. An initial quick check is performed to determine whether the refactoring is applicable at all in the context desired by the user (checkInitialConditions()). The user is asked for additional information if necessary. After all necessary information is available for executing the refactoring, a careful check is triggered (checkFinalConditions()) and the individual changes in the source text are calculated (createChange()). The preview dialogue displays the changes; the user confirms them and the LTK applies them to the workspace. The API classes in both the LTK core and UI plug-ins incorporate this sequence. The individual steps will be explained in detail below based on the code of our example plug-in. A subclass of org.eclipse.ltk.core.refactoring.Refactoring must always be created. This class is the core of a refactoring; all validations of the necessary operations are performed within it; even the actual changes to the source text are calculated here. The methods mentioned in the process under 2. and 4. are part of the protocol of this class. A subclass of org.eclipse.ltk.ui.refactoring.RefactoringWizard is required on the UI side. It is primarily responsible for managing the individual pages of the Wizard, which the user scrolls through by means of 'Next' and 'Back', and for invoking the final operation when finishing the process. All these tasks are already taken over by the super class (RefactoringWizard). It is necessary to provide the wizard with a reference to a Refactoring subclass and to insert one?s own additional wizard pages (derived from UserInputWizardPage) if required. These pages are displayed during the course of the refactoring in the wizard. Step 1. The typical trigger for a refactoring is an action of the user when working in an editor or a click on a menu item in the Outline View. In both cases, it is an implementation of an Eclipse action that provides the entry point for the refactoring. In the run() method, instances of RenamePropertyRefactoring and RenamePropertyWizard (the respective subclasses of Refactoring or RefactoringWizard in the example implementation) are created and the refactoring lifecycle of the LTK is started by means of a RefactoringWizardOpenOperation (Listing 1). First, the available information about what the user selected when he triggered the refactoring is collected. With the current selection, it is possible to determine which language element should be renamed, moved or manipulated in another way. 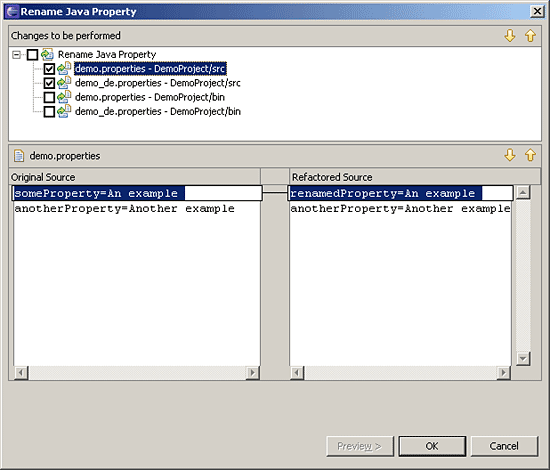 The example plug-in has a text selection; the selected text and its position in the text document are saved in an Info object, which is evaluated later in the RenamePropertyRefactoring. Step 2. The LTK assumes control of the subsequent process. It first invokes the method checkInitialConditions() on the refactoring object. This method should perform a quick check to determine whether the basic conditions have been met for the refactoring. The example implementation merely verifies that the user has actually selected an existing key in a properties file. If it encounters a fatal situation (e.g. a write-protected source file), it generates an object of the type RefactoringStatus, which contains more information about the problem (Listing 2). In such a case, the LTK does not continue with the refactoring but instead informs the user about the abort by means of a dialogue box. Step 3. After determining that there are no fundamental obstacles preventing the renaming of the key, the wizard is displayed and asks the user for additional information: For example, the new name that he wants to assign for the language element; as well as information about the scope where the refactoring should be applied (only in the current source file, in the project, or in the entire workspace). The UI required for this purpose is implemented as subclasses of UserInputWizardPage. The data entered here is made available to the RenamePropertyRefactoring with the help of the info object (which plays the role of a presentation model). Step 4. Before the wizard shows the last page, which offers a detailed preview on the changes to be performed, two things happen: The method checkFinalConditions() is invoked on the refactoring object and the actual changes are calculated on all of the files concerned. The latter must be implemented in the method createChange(). The example implementation demonstrates these two steps by first searching all properties files concerned in the workspace and checking to see whether they can be edited; at the same time, occurrences of the property key are found. A TextFileChange instance that describes the replacement of a range of text at a given position in the file is generated for each of these occurrences (Listing 3). These Change objects are arranged into a tree-like structure whose root is returned by the method createChange(). (It is out of the scope of this article to discuss the manipulation of text files across the entire workplace. A good introduction to this topic is offered by ). Figure 2: The preview page gives an overview of all changes in the course of the refactoring. The Language Toolkit facilitates the implementation of automated refactorings. It defines the process of a refactoring and provides abstract classes in the core (Refactoring, Change) as well as UI components (RefactoringWizard) that largely cover the language-neutral part of an implementation. The language specific calculation of the changes in the source text can be inserted in this frame so that users can implement the refactoring in the familiar form of the Java refactoring support known from JDT. Leif Frenzel is the Senior Architect at Innoopract. His main field of work is the Eclipse-Distribution Yoxos as well as development environments based on the Eclipse platform. In addition to this, he is the author of Open-Source-Plug-ins for the Support of Functional Programming Languages in Eclipse.